This entry was posted on Friday, January 15th, 2016 at 3:59 pm. It’s incredibly difficult to put exactly into words what American Pharoah has done for me and many other horseracing fans alike. I was born in 1982, which means that I had never, in my lifetime, witnessed a Triple Crown winner. I witnessed, multiple times, Triple Crown attempts, the most gut-wrenching, for me, being Silver Charm in 1997. But I had never seen history made. Critics in recent years said that there’d never be another Triple Crown winner. That it was just too hard. Today’s horses were bred for speed, not stamina. It was physically and genetically impossible: three races in three states at three distances in five weeks. But I knew it would happen again. Some day. History was bound to repeat itself, and the hardest sporting accomplishment would be achieved again. One day. June 6, 2015 was that day. After his stunning Preakness win in the slop at Pimlico Racetrack, I had my eye on him, American Pharoah. I read every interview with Bob Baffert and Ahmed Zayat. I watched that horse like a hawk. Pictures, videos of his work-outs, social media posts showing him lounging in his stall. I was on top of his every waking move. And as the days counted down, one thought kept rolling through my mind. He’s looking great – I think he could be the one. When Pharoah coasted into the first turn during the Belmont Stakes, he threw those ears forward, pricked and alert. I knew this was a good sign. He was loping along smoothly, his gait so fluid and easy. I was out of my seat by the far turn, and as Pharoah started to turn it on, I knew he had it. There was a brief moment as he flew under the wire that I doubted my own eyes. Did this just happen? Did this one thing that I’ve wanted to see forever actually happen? “And here it is! The 37 year wait is over! American Pharoah is finally the one! American Pharoah has won the TRIPLE CROWN!” Larry Collmus’ call will stay with me forever. A few short months later, on Halloween, I gathered with my friends and family at Keeneland Racetrack. 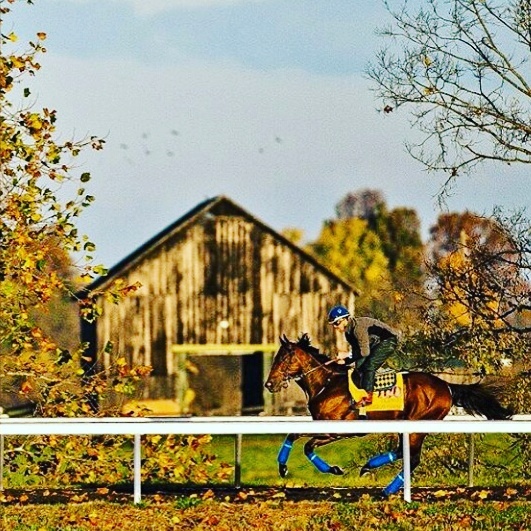 Interestingly, we had purchased our Breeder’s Cup tickets in July of 2014 – which means we simply got lucky to have the Triple Crown winner there that day. And here I was, watching him, in person, run the final race of his career. You could hold in your hand the suspense that hung in the air as he warmed up with his lead pony directly in front of where we were standing at the final turn. We had to watch most of the race on the large jumbo-tron that was set up in the infield. Just like in the Belmont, Pharoah took the lead early and never let go. I still cannot believe how incredibly fast they flew around the far turn. Just as Pharoah came into view, he was gone, just that fast. And he kept pouring it on until he brought it home. The first Grand Slam Winner. I remember thinking in that moment, that this is what life is all about. Amazing moments that will live with me forever. And that everything will always be okay because I can always return to this moment. I can come back to live this moment again and again. 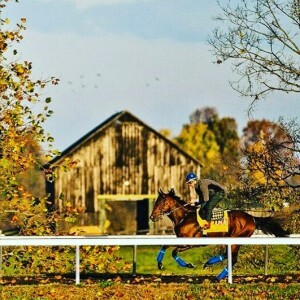 American Pharoah – and that memory – gave me more than I ever thought possible. And that’s what horseracing is – more. It’s more speed, more power, more hype. More energy. More thrills and, unfortunately, spills. More broken dreams and more outstanding triumphs. More history. More failures and successes. More hope. In two minutes or less. All year long, American Pharoah gave us hope. Thanks for ride, big guy.